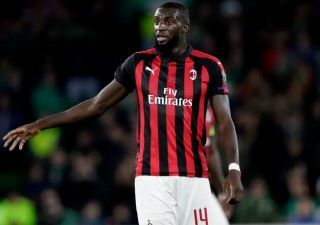 Tiemoue Bakayoko has dropped another major hint that he wishes to secure a permanent move to AC Milan this summer from Chelsea. As noted by Sky Sports, the 24-year-old joined the Italian giants on a season-long loan deal from the Blues last summer, and they hold a €35.5m option to buy to make it permanent at the end of the campaign. After a difficult start to life in Italy as he struggled to impress in his first few appearances, Bakayoko has now gone on to feature 31 times across all competitions, establishing himself as an ever-present in Gennaro Gattuso’s side and a fundamental piece in the heart of the midfield. Having shown his importance and rediscovered his best form, he has been a key factor in Milan moving up to third place in Serie A, and now the Frenchman has seemingly dropped the biggest hint yet that he wants to join the Rossoneri on a permanent basis this summer. Time will tell if Milan achieve that objective, as they still face stiff competition from the likes of Inter, Roma and Lazio for a top-four finish this season. The focus for Bakayoko and his teammates will be to end the season strong and seal a return to Europe’s top table, and that in turn could then lead to a permanent stay for the former Monaco ace. Having been shipped out by Chelsea after a disappointing debut campaign at Stamford Bridge, Bakayoko looks to be settled in Italy and is proving his worth. If he continues to play such an instrumental role in Milan’s pursuit of Champions League qualification, it’s hard to see them not exercising that option and giving him the chance to play European football at San Siro next year.